Rangers are on the brink of sealing a deal for 20-year-old Colombian striker Alfredo Morelos who plays for HJK Helsinki. Jonne Lindblom, of Golden Star Management, who is Alfredo Morelos’ agent confirmed yesterday that they are in talks with Rangers and the two clubs have agreed a fee. It is now only a matter of getting a work permit sorted out for the player. 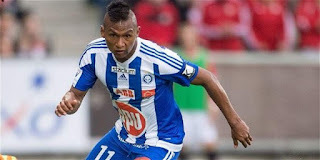 The Colombia youth international has scored 46 goals in 62 appearances for HJK, and Morelos is delighted to come to Scotland to play for the Ibrox giants after the fee of around £1million was agreed for this young scoring star. Rangers head coach Pedro Caixinha is keen to continue his early recruitment drive with the capture of Colombian youth international Morelos, who has struck 11 goals in nine games in Finland's Veikkausliiga this season already. Caixinha has narrowed down a list of strikers to focus on young Morelos, with the Europa League qualifiers just three weeks away prompting so many swift decisions being made. The 20-year-old Colombian forward is nicknamed ‘The Buffalo’ because he is as strong as an ox and a great runner, but they preferred to call him buffalo. He was recommended to Rangers by Ibrox assistant coach and Jonatan Johansson, the Finn naturally being familiar with his home league. In the Finnish league, HJK Helsinki lead by six points and Morelos has scored 11 goals in only 9 games with four assists while scoring five goals in only 7 games in the cup. The striker has also scored 4 goals in 6 Europa League matches. Last season at only 19-years-of-age, he scored an incredible 30 goals in only 43 matches. Morelos has represented Columbia at U-17 and U-20 level and his idols are countrymen Carlos Bacca of AC Milan and Monaco star Radamel Falcao. He watches all their movements, runs made and goals that his favourite players score. He is very excited about the possibility of joining one of the biggest clubs in Europe and he is also aware that Rangers have been struggling for a few years. He can see that the club is now moving in the right direction with many great signings and the promise of more to come. His agent and the player believe that Ibrox is the ideal choice for him to showcase his talent and to help the team get back to the top. This confident striker’s intention is to move to Scotland, score goals for Rangers, play well enough to be able to move on to a better league, after 2 or 3 years of being a huge success in the SPL. He wants to use us as a stepping stone for bigger successes, and do you know what? – I don’t have a problem with his thinking at all. I want him to transfer to either an English, Spanish or Italian Premier league, to whoever will pay Rangers the best money offers. He believes he has the ability to play at the highest level, therefore we should want him to move for a big chunk of money and for Rangers to add a 10% clause on to any future transfers. If he reproduces his form with the ‘Gers, as he has in Finland, we will be very happy fans who will enjoy his skills while we have him displaying his full array of talents down in sunny Govan. Here’s hoping Pedro works his magic yet again! this guy can score and be sold on for 20 millions!get him pedro. Richard again well done on a good article.. Sorry for busting your chops on this one but this boy is exciting news! Get him in fast before some one else takes him,Selltic will soon be spending there money so we need to get in the ones we want,Selltic can spend 10/20 million without selling they could cash in on players when they want some thing we should be looking forward to do,i just hope Pedro is not just buying in when players who put there hands up for 5 or 10k a week i would come for that money i just hope Pedro is not just another MW with one or two good players and the rest just dross. The deal has supposed to be done and now just waiting for the OK to the work permit to be granted. Wow we haven't even signed him yet never mind see him play and some people have got him sold on for 20 million. Let's not get carried away here guys, the players we are signing with the exception of alves are not of a very high calibre, hopefully Pedro knows what he's doing because if it goes pear shaped we are in serious bother. Not wanting to sound negative just think we should all be cautious after last seasons disaster way the loaf. Am with you,will Pedro last six games if he has got it wrong after all the money and talking he has done?. Well Alfredo's on his way and I'm a happy man this Monday. Good news all round Garner is on his way tae the Tractor Boys in what's looking a done deal..Scored some goals near the end but his behaviour on the pitch was a disgrace - Jack would've loved playing with him lol..Aye Warburton and McParland had an eye for players ( a glass one at that ). Rangers are taking a hit but gets him aff the wage bill end of..